Features: – perfect to be put at the entrance of your home. – acts as a wall dacor & enhances the beauty of your wall. – the ‘triple owl motifs’ are handcrafted in wood attached to the name plate. – the base is mango wood & owl motifs in pine wood. – the base is handpainted in brown & owl motifs are multicolored. – comes in 13.1″ (L), 0.8″ (W), 7.7″ (H) inches in size. – personalize your home entrance with this hand-written nameplate to create an impression. 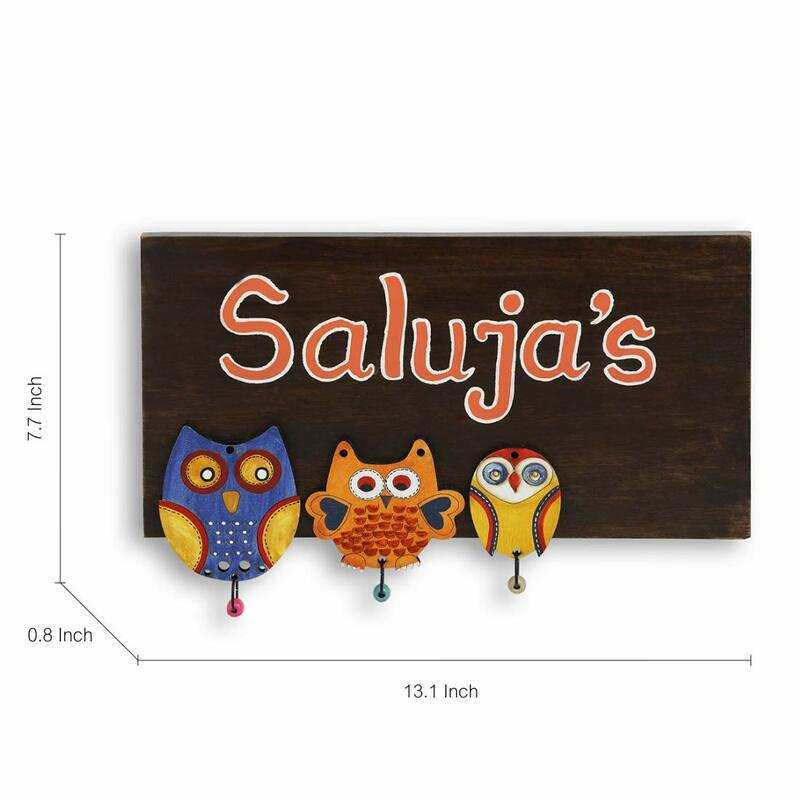 Art type: handpainted & handmade material: base: mango wood, owl motifs: pine wood dimensions: (L * W * H) = (13.1 * 0.8 * 7.7) inch color: base: brown, owl motifs: mutlicolored: 1. as the font is hand-written there might be a slight variation in the font style.2. you need to put 2 nails to hang the name plate.3. once your is confirmed, our care team will get in touch with you within 48 hours, to confirm the name to be put on the name plate.4. it can accommodate around 6-8 characters depending upon the size & placement of the name.5. As this product is handcrafted there might be a slight color or design variation, which is natural and hence makes the product unique.